I arrived at Downpatrick Head in good time. 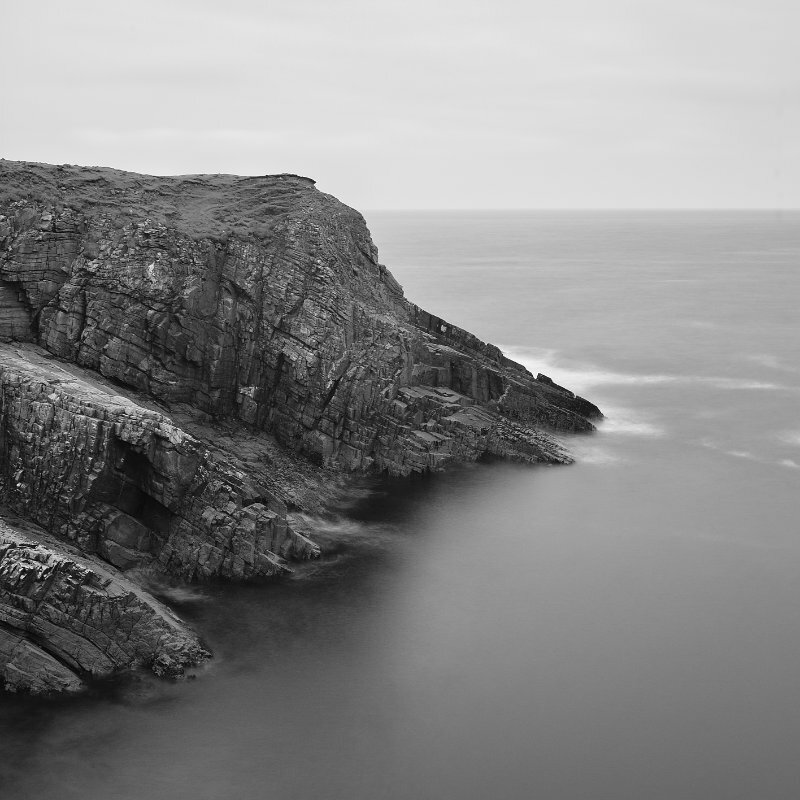 From a previous visit to Dún Briste (North Mayo Coast) I knew that I wanted to capture it at an angle which made it look the skinniest and that I wanted it to be a long-exposure shot. For this I needed an overcast morning (I settled for mostly cloudy) because otherwise the difference in exposure between the sky and the rest of the image would be too great. I also needed the wind to not be coming in from the direction of the sea, otherwise I’d get sea spray all over the lens. I was lucky enough to get conditions close enough to what I needed on a day where I was able to actually go to the location. With only a light wind it is a really nice place to be when the dawn is breaking. When I decided to leave I drove west to a location I’d spotted on the previous visit to this coast – an old ruin with a mountain range behind it. The light was very patchy but I was hoping I might get lucky and the sun would send a spotlight through the clouds. It did light up the scene quite nicely, but unfortunately only when I was parking the car. I walked across a bog and set up the camera and waited for it to happen again. But it was obvious from the amount of cloud cover in all directions that it wouldn’t. However, from where I now stood I could see the rugged coastline and decided that since it was a good day for long-exposure shots, that I should go get some. To get the image below I had to climb out along a narrow ledge above a sheer drop to the water. The tripod couldn’t support itself and I had to hold on to one of its legs and be sure to stay still long enough to get the exposure. When I’m out all day taking photographs I set Google Maps so that my wife can see where I am. This is so she doesn’t have to ask me where I am or how long it will take me to get home. I was thinking as I was sat on the ledge that if I should fall she’ll be able to see my last location and someone would at least be able to retrieve my camera bag which was safe further up the cliff.